Back-formation from termites. Possibly from Latin termites (three syllables), plural of termes. Also possible a derivation from Proto-Indo-European *term- (“drill”). A white-bodied, wood-consuming insect of the infraorder Isoptera, in the order Blattodea. (intransitive) Of a chimpanzee: to catch termites by inserting a stick or vine into their nest and waiting for them to climb up it. Termites are a group of eusocial insects that, until recently, were classified at the taxonomic rank of order Isoptera (see below), but are now accepted as the epifamily Termitoidae, of the cockroach order Blattaria. 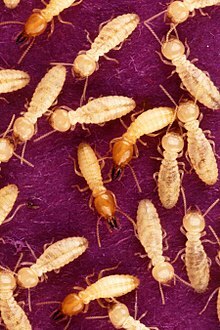 While termites are commonly known, especially in Australia, as "white ants," they are not closely related to true ants.